Everyone's favorite rambling Texan actor Matthew McConaughey discovered he had a very special neighbor during a trip to New Orleans. McConaughey was hanging out on a balcony, doing typical McConaughey stuff, when fellow handsome actor person Brad Pitt emerged from a balcony across the street. Brad Pitt had some fun with pal Matthew McConaughey on Saturday, May 17 while hanging out in New Orleans. 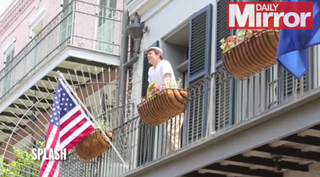 As the Dallas Buyers Club star was enjoying some sun on his balcony with football star Drew Brees, Pitt caught his attention from the balcony across the way. Angelina Jolie's fiance then tossed a cold beer can to his friend, which McConaughey happily accepted and was later photographed drinking. This year's Best Actor Oscar winner was in Nola for a charity gala at the House of Blues to support the Just Keep Livin' Foundation and the Brees Dream Foundation. See? Typical, normal, everyday people stuff. "Whatcha up to out there, honey?" "Oh nothing. Just tossing a beer to McConaughey."